UAE-based Gulftainer, a leading privately-owned independent terminal operating and logistics company, said the Iraq Container Terminal (ICT) being operated by the company at Umm Qasr Port in southern Iraq, has registered container volumes of 2 million twenty-foot equivalent units (TEUs), since it started operations in the region less than nine years ago. Gulftainer was the first foreign investor to launch a joint venture with the General Company for Ports of Iraq (GCPI) in Umm Qasr Port, starting operations at the Iraq Project Terminal on Berth 8 in the South Port in August 2010, followed by ICT on Berth 11 in the North Port in 2012. The company has invested heavily in ICT to develop a 376-m berth and container storage area within the 342,000 sq m terminal that currently has the capacity to handle in excess of 400,000 TEUs per year, allowing for future volume increase. The berth is equipped with two Mitsubishi ship-to-shore gantry cranes, supported by two Gottwald mobile harbour cranes with a 100-tonne lifting capacity, in addition to container-handling equipment including 18 reach stackers, two empty handlers and 28 terminal tractors, said the UAE group in its statement. ICT currently employs 250 locals and a support team of 50 expatriates. Since November 2018, Gulftainer also operates the Iraq South Terminal IST, on Berth 4 in the South Port that features 230 m of quay and a yard handling capacity of 100,000 TEUs per annum. Nic Gray, General Manager of Gulftainer’s operations in Iraq, said: "The latest developments at ICT and Iraq South Terminal in 2018 mark impressive milestones for Gulftainer in Iraq. The company offers reliable services, fast vessel turnarounds, competitive rates, 48-hour customs clearance, dedicated in and out gates, and an on-terminal customs scanner." "With its extensive experience in terminal management that dates back to 1976, Gulftainer’s efforts have helped enhance the capacity of these terminals to meet future growth." he stated. This year the company plans to expand its storage space by introducing two new yards and increasing ICT’s annual handling capacity to 650,000 TEUs. In addition, the company will launch a new customer web portal, allowing for container and vessel tracking, generating online proforma invoices and sharing up-to-date terminal information." 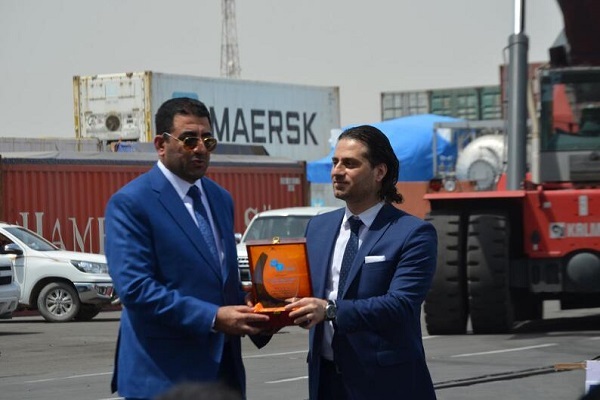 Gulftainer celebrated the latest achievements at an event held in Iraq that drew the participation of Dr Safaa AJ Alfayyadh, Director-General of the Iraqi Port Authority (IPA) port directors, senior officials from customs and borders authorities, and other distinguished guests. Speaking at the event, Ibrahim Serhan, Middle East Regional Manager at Gulftainer, said, "The success of ICT reflects Gulftainer’s commitment to implementing the latest best practices in port management." For his part, Dr Alfayyadh said: "On behalf of Abdullah Luaibi, Minister of Transport of Iraq, and IPA, we congratulate Gulftainer on this latest achievement that is attributed to the efficient management and excellent operational capabilities of the company."